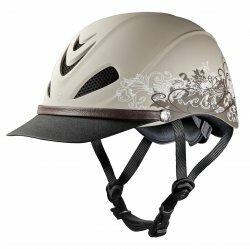 Troxel Dakota helmet with the Trail Dust, Grizzly Brown, Badlands, or Turquiose Paisley graphics. This updated low profile is one of Troxel's most popular western trail riding helmet. With the largest vents available, this Western helmet will keep you cool during long rides. Only in stock items will be shown in the drop down lists for the shopping cart. 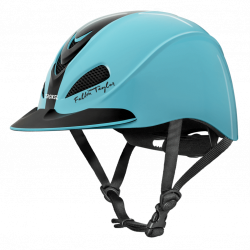 Troxel Liberty low profile schooling helmet. Ultralight, low profile design created for schooling and all-purpose riding. Large vents provide superior ventilation for a cooler, more comfortable ride. Now with the poplular dial fit system. An extended Soft-Tipvisor provides extra sun protection. 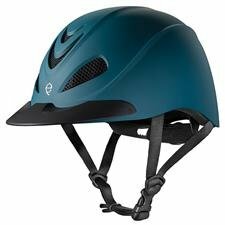 Troxel Liberty low profile schooling helmet. Ultralight, low profile design created for schooling and all-purpose riding. Large vents provide superior ventilation for a cooler, more comfortable ride. Dial Fit size adjustment. An extended Soft-Tipvisor provides extra sun protection. Pearl Color has been discontinued, limited stock available.